A Special February Fashion Giveaway! Iconic Canadian fashion label Rock ‘N Karma is famed for their signature miracle fabric. The collection is painted & beaded couture blended into black, for styles that easily move from day to evening. Rock ‘N Karma has been using the same unique design technique and concept since it’s inception. Sisters Naomi & Devorah – raised in Toronto, have drawn inspiration from multiple avenues. It is all things innovative, chic, & everything in between. They’ve been our go-to designer for our red carpet, rock gala and TV appearances for the last ten years! And for Valentine’s Faze wants to share the love and give you a chance to take home some amazing Rock ‘N Karma pieces! One winner takes all! 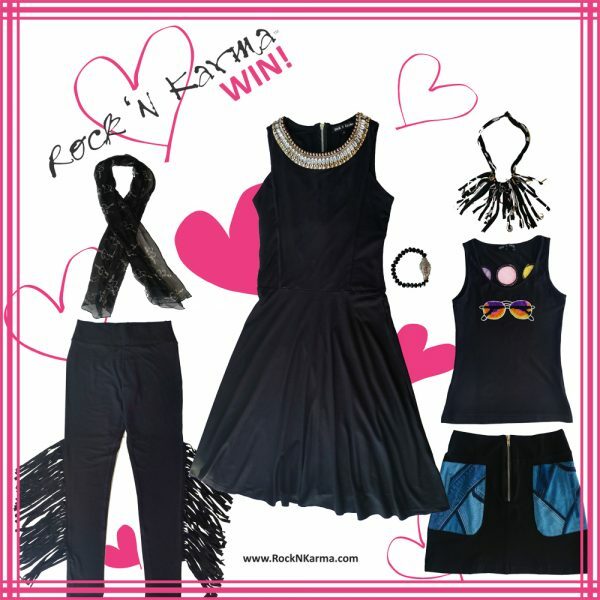 Prizing is as shown here plus a stunning zippered dress and a beaded necklaces, in combination of sizes S and M.
Discover Rock ‘N Karma on their official Instagram page. CONTEST RULES: No purchase necessary. Contest entry deadline is February 20, 2017, midnight EST. Number of entries limited to one entry per person/email address per hour. Competition open to residents of Canada excluding residents of Quebec. Entrants must be at least 13 years of age (or older if required by the laws of the province or state in which you reside.) Ineligible entrants include all employees of Faze Media Group companies, Rock ‘N Karma, their families, agents or anyone professionally associated with the administration of this promotion. Completed entries will be combined with contestants who have fulfilled entry requirements on social media and all will be entered into a random draw for one (1) prize winner. Chances of winning depend upon the total number of entries. Prize winner will be notified within 2 business days of closing date of the contest. Any unclaimed prizes will be forfeited after one month of the closing date. There is no substitution available (sizes are as is) and there is no cash alternative. The prize for the competition has a suggested retail value of $1000. Items may not be exactly as shown or described.